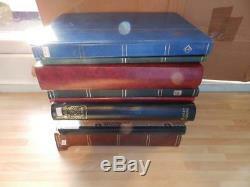 (4165) GB STAMP COLLECTION M & U IN 10 STOCK ALBUMS + ALBUM. ABOUT 35-40% OF THE COLLECTION IS SHOWN IN THE 100 PICTURES BELOW. SOME OF THE QE2 MINT BLOCKS WITH BROWNING ON THE REAR AND SOME ALBUM PAGES ARE DISCOLOURED. THE NUMBER IN BRACKETS BEFORE THE DESCRIPTION OF THE STAMP IS AN INTERNAL REFERENCE NUMBER ONLY FOR OURSELVES AND DOES NOT RELATE TO QUANTITY OR STANLEY GIBBONS NUMBER. ALL OF THE COLLECTION IS SHOWN IN THE PICTURES UNLESS OTHERWISE STATED. IN UK POUNDS AND POSTAL ORDER. Txzj pxzj5248 txzj-11 txzj19 txzj109 txzj115. The item "(4165) GB STAMP COLLECTION M & U IN 10 STOCK ALBUMS + ALBUM" is in sale since Tuesday, January 22, 2019. This item is in the category "Stamps\Great Britain\Collections/Mixture\Stamps". The seller is "wildaboutstamps" and is located in SCUNTHORPE. This item can be shipped worldwide.